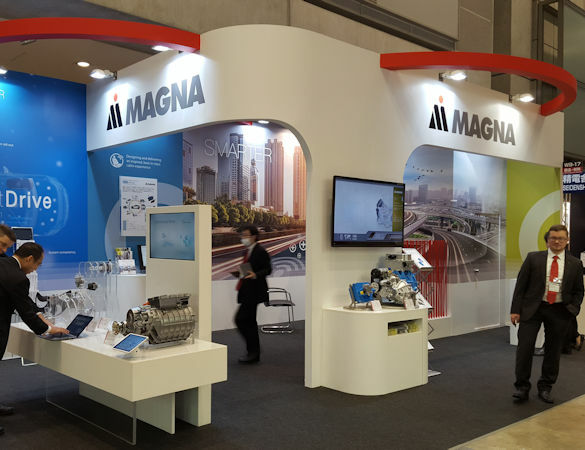 Magna Exhibit by Idea International, Inc.
Magna International Inc. is a global brand-independent automotive supplier that primarily targets OEMs. Exhibiting at JSAE was part of the company’s expansion into the APAC region. JSAE attendees have the opportunity to experience the latest automotive technology–and while the show attracts engineers, it also lures enthusiasts interested in automobiles. The 6m x 12m Magna exhibit at JSAE offered attendees, particularly engineers, hands on experiences at the demo counters, while the overhead canopy supplied attractive lighting in the space. The large format graphics let attendees know that Magna was all about automotive innovation.